Living at Chateau Frankenstein in Geneva, Switzerland, Victor and his twin brother Konrad never want for anything. They have doting yet pragmatic parents, a cousin Elizabeth whom they love like a sister, and servants who are treated as part of the family. 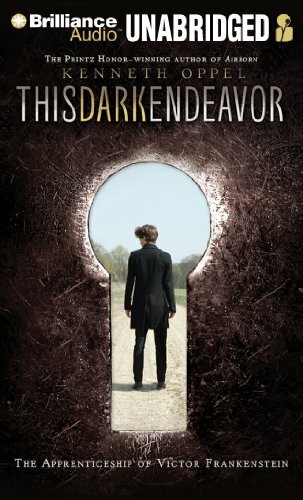 Victor, Konrad, Elizabeth, and their best friend Henry love to explore the secret nooks and labyrinthine passageways of the chateau and think they have seen all there is to see... until one day they stumble upon a hidden library full of books containing dark potions and untranslated alchemical formulas. When their father discovers that the boys and Elizabeth explored the Dark Library, he expressly forbids them to ever enter the room again, declaring that he has kept the room secret for a reason. However, when Konrad falls ill with a mysterious malady that cannot be cured with conventional medicine, Victor, in desperation, turns to the Dark Library to find a recipe for The Elixir of Life. As if caught in a contagion of his own, Victor's desperation ends up unleashing some very dark forces, not just through his attempts at alchemy, but also within himself. The tag line of This Dark Endeavor is: The purest intentions can stir up the darkest obsessions. I can't think of a better way to describe this book. The entire exposition as we get to know Victor and his family is almost idyllic in its delivery. Their happiness as a family and contentment in their household is strikingly juxtaposed with Victor's obsession at curing what appears to be his brother's terminal illness. Victor begins the novel as quite a likeable character. He and his brother banter back and forth with mirth and deference. Their relationship with Elizabeth appears to be one of mutual respect and felicity. Their parents are so agreeable that they treat their servants with respect and provide for them fair wages and benefits. Which is why Victor's change of character becomes so jarring. What begins as a loving desire to help his brother, quickly turns into something macabre and nefarious. The reader just wants to take Victor by the shoulders and shake him out of his perverse obsession. This would be a fantastic novel to use when discussing the concept of the tragic hero because, while Victor's narrative is not tragic in death, he certainly comes to an obvious and tragic downfall. My foremost reason for wanting to read this book was merely due to my admiration of Oppel's previous books. Half Brother, which was published in 2010, is one of my favorite books of all time and Silverwing, which I initially did not want to read, became one of the few animal fantasies that I can actually stomach. But had it not been for the name on the front cover, I probably would have passed this book by. As someone who has never read Mary Shelly's Frankenstein, I really had no interest in reading a prequel to the famous tome. But Kenneth Oppel's writing style has always sucked me in and I had a feeling that despite my trepidation at the subject-matter, I would not be disappointed with the writing, and sure enough I was not. Kenneth Oppel's writing is so vivid in its delivery it is almost cinematic. I am holding out hope that one day movie producers will see the potential in his books and make them into movies. This Dark Endeavor probably has the likeliest chance of becoming a movie due to the popularity of the subject matter and the fact that producers seem to like making period movies. The audience for this book is marketed as young adult, but I would say it has a foot planted in both YA and middle grade (just like his Airborn series). It would be especially enticing for middle grade kids who like dark fantasy a la Neil Gaiman or even J.K. Rowling in the later years of Harry Potter. In my opinion, this book is tagged as YA for the simple fact that the major characters are teenagers, but there is nothing wildly inappropriate in this book, only a few strange/uncomfortable kissing scenes. Audibook notes: Luke Daniels is the narrator of the audiobook and he was the perfect choice for the role of Victor. His voice is youthful enough to pass as a teenage Frankenstein, yet gritty enough to enhance the treachery and depravity of the narrative. I judge an audiobook's success on how much I look forward to my long work commute everyday and this was one of those audiobooks that helped me forget I spend two hours a day in the car. I love the cover of this book. Thanks for the review! This sounds amazing, I'll definitely have to give it a listen!